It seems that she is turning 39, again… for the +20th time…! Lol! Last year, I made her a cake, but this year, she’s getting CAKE POPS! 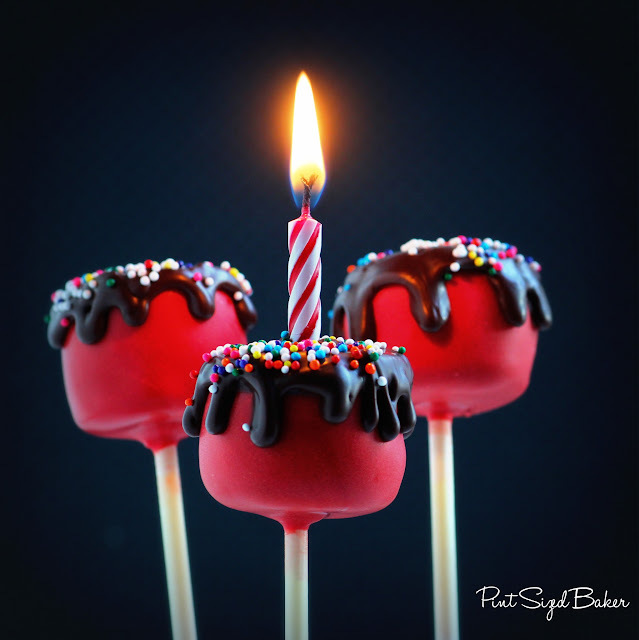 Fun, little Cake Pops, because the are, well, fun! Her favorite color is RED so I made them red cake pops with chocolate frosting dripping over the edges. And lets face it, we can’t have a birthday cake without sprinkles! I hope you liked them, Mom! Happy Birthday! To make these Cake Pop you will need 1/4 of a 9 x 11 cake and a 2 Tbls of frosting. Combine them in the mixer and then measure out 12 equal cake balls. Wanna see a video of me making some pops? Click HERE! 2. Shape the cake balls into hockey pucks by gently flattening the top and bottom and then pinching the edges to get a sharper edge. Then place into the fridge while you melt your candy coating. 3. Melt some Candy Melts according to directions. I used less than half a bag of Red Melts. 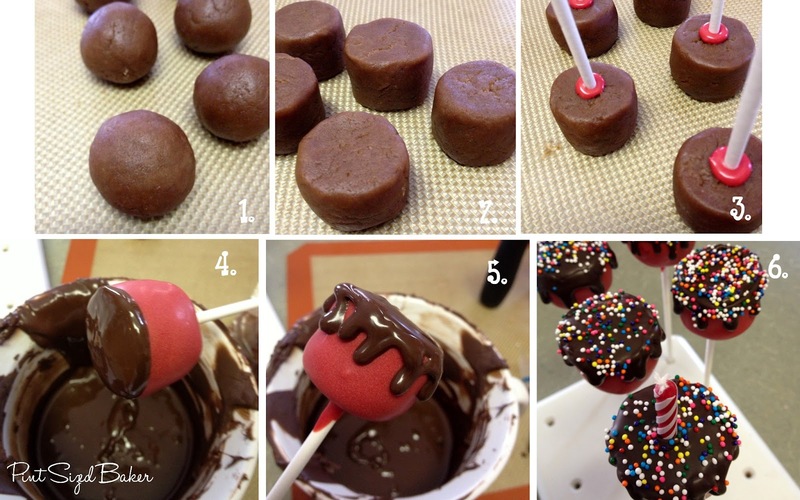 Dip the stick into the melted candy and then into the cake ball. Complete all pops. Dip the cake pops into the candy and coat completely and stand up to dry. 5. …draw the dripping edges with the chocolate in the baggie. Work quickly and don’t let the candy harden. 6. Sprinkle tops with colorful sprinkles. Add a candle if desired. Stand up to dry. LOVE these! They are so cute 🙂 What a sweet treat for your mom's 39th (or so she says 😉 birthday! Holy cow Karyn these photos are stunning. STUNNING! And the pops are amazing. So pretty! Happy Birthday to her! My mom is turning 39 for the 20+ time in February, lol. Love the chocolate dripping over the edges, and the blown out candle pic…amazing! 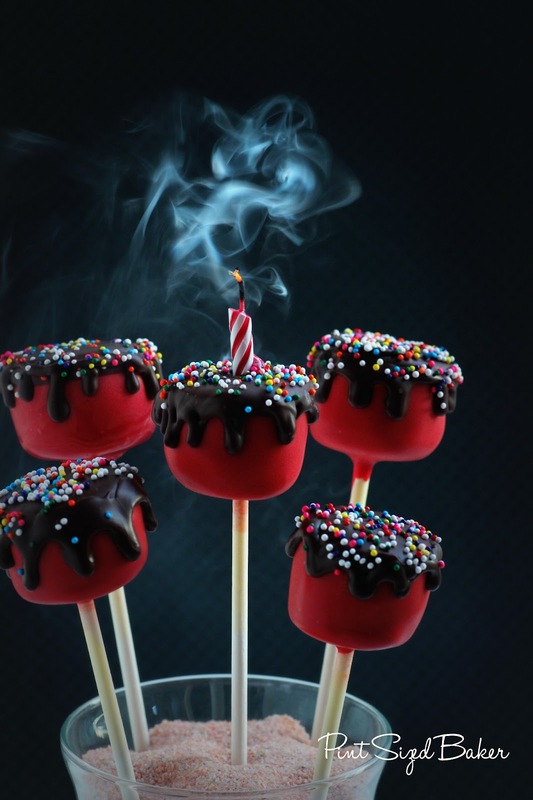 Love, love, love these cake pops! The pic with the candle blown out is awesome! Your photos look great. Happy Birthday to your mom. These are too cute. Pinning them for our next party. Fantastic! happy birthday to her! 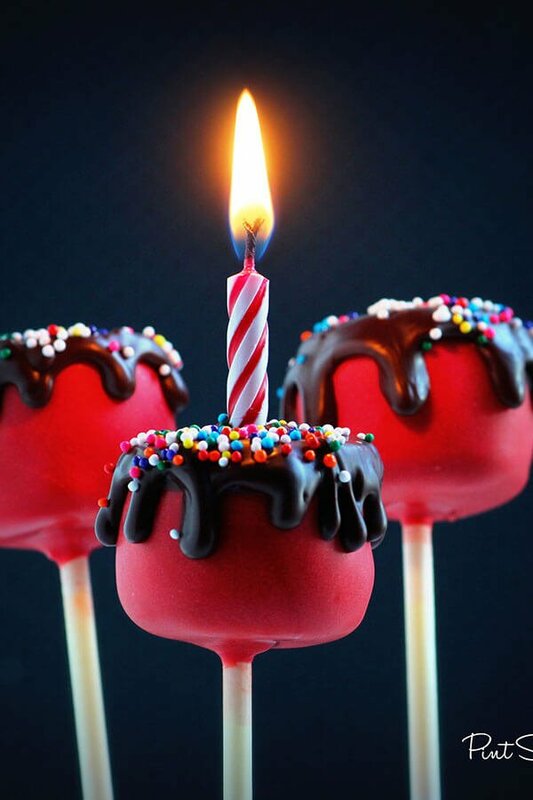 I have seen a lot of cake pops in my day and these are one of the cutest! Happy Birthday to your mom! First I need to start by saying your pictures are OUTSTANDING!! I love the one with the candle that was blown out and how you captured the smoke with such clarity. Each shot is absolutely beautiful. The bonus is that on top of all that, this recipe sounds so good and these pops are adorable. Everything a good piece of cake should be… cake, frosting, chocolate, sprinkles. Love them! Great job, these look so amazing. I really, really, really, love these Karyn!! Your mom is lucky!!! I'm going to have to attempt these for my birthday! These are awesome! You really outdid yourself on the photography, EXCELLENT pics! Wow amazing idea with the candle, have never seen it before! Thank you for sharing the awsome idea, so nice job! Quick questions: Is 9×11" cake correct? I've never heard of this size of a cake. 9×13" sure, but 9×11"? Never! Thanks so much for your time. These are just so cute! Happy birthday to mom! I've been turning 29 for about 17 years now, it works! Those are some amazing pictures!!! I love love love the candle shots and the smoke shots. Shoot I just love everything about this post!!!! Karyn! These pops are oh-so adorable! 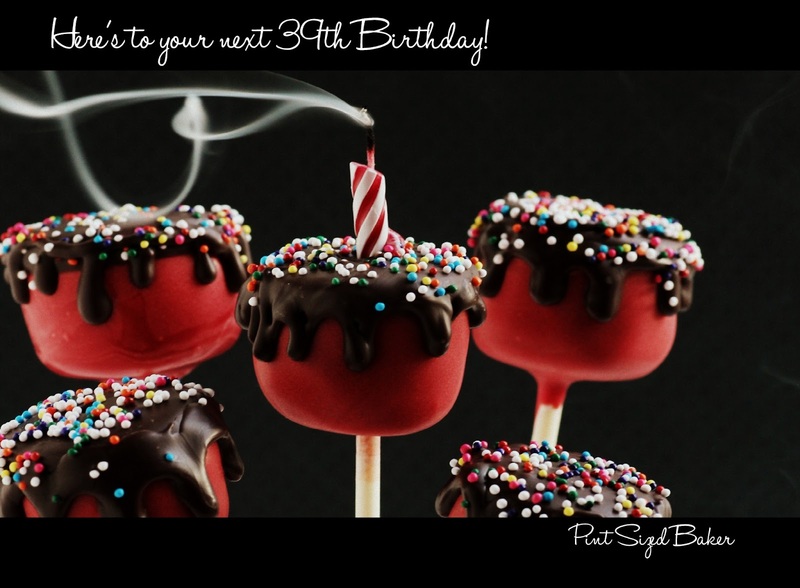 You're such a cake pop master 🙂 and holy cow, I LOVE your photos! The one with the smoke is absolutely perfect. Happy Birthday to your mama! I'll say it again….I LOVE THESE!!!! They might be my favorite. That red is spectacular! Thanks for sharing at One Creative Weekend! Um, I'm feeling like a total slacker. 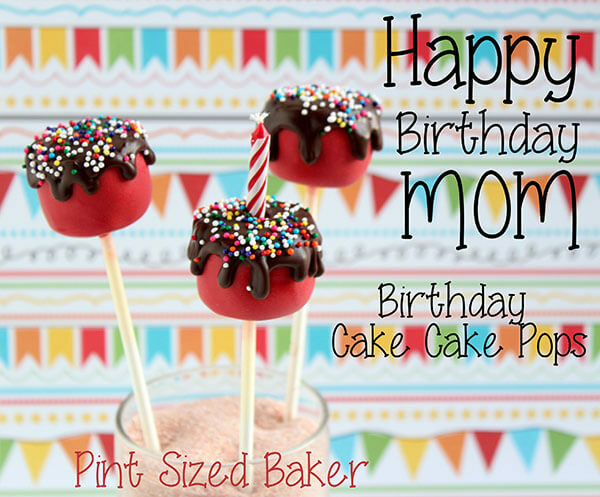 My mom's birthday was yesterday and I totally did not make her any adorable cake pops! Thanks for linking up to What's Cooking Wednesday! I'm featuring you at One Creative Weekend! These are just precious Birthday Pops! Hope you are having a great weekend and thank you so much for sharing your awesome recipe with Full Plate Thursday. My son's 20th birthday is coming up and I have been planning his birthday care package. A cake is not very mailable and cake pops had crossed my mind, but I couldn't think of how to decorate them. I am soooo happy to have found your blog and this post! This will be perfect. Your photos are amazing, especially that last one with the smoke… you'll have to come visit and give me some lessons – they're awesome! And the red really makes them WOW! Thank you so much for sharing this at Wednesday Extravaganza – hope to see you there again next week – and don't forget the voting is today! I want these for my birthday! Oh I am in love with all your cake pops! You are a genius! I would love to have you come link up at my Show Me Your Plaid Monday's! These are so cute. I love them. Such a cute birthday idea! Thanks for linking them up at The Weekend re-Treat! Gorgeous! And your photos? WOW! Thanks so much for linking up at What's In Your Kitchen Wednesday! Love these, what a fun idea! A-mazing! You are amazing with what you make. Thanks so much for linking up at Real Family Fun. I love these! They make me smile just looking at them. Anyone would be thrilled to get these for their birthday!